An update on that Wi-Fi streaming experiment… EPIC FAIL! The wife mucked about for a good few minutes of pointless buffering hell but ended up watching a DivX transcode of some Jiggling About With Jillian methinks (directly off her flash drive). I have always had a fascination with desktop modification/replacement and Windows Se7en is honestly the first OS I have installed that does most of what I like without much tweaking or coercion. Desktop wallpaper switching, sidebar/desktop gadgets/widgets… and don’t get me started on the new “Super Bar”. Aerosnap and Aeroshake functionality also gives me a large techno-woody!! I have used a quadrant based desktop real estate management system for years now, and it is really refreshing that Windows finally caters for user who do exactly that with Aerosnap. 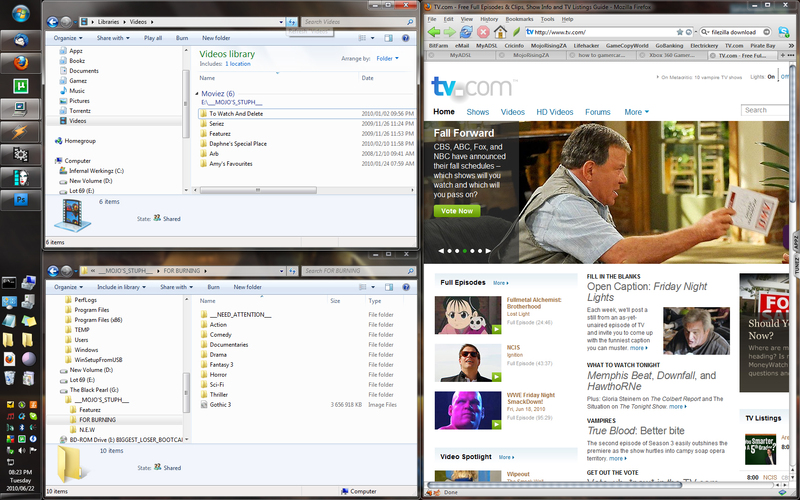 Firstly, a configuration I use for torrent administration. 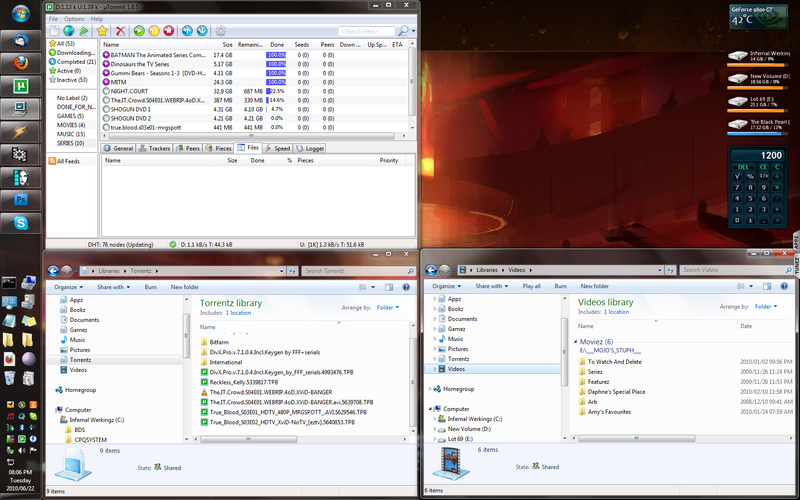 This config allows me to keep an eye on my torrent list (uTorrent client) aswell as my torrent folder and a destination folder (ie Tier 2 of my file system, organised by type/genre). Also, not making use of the top right quadrant means I can monitor HDD capacity (usually running at almost max 😦 ) using Sushi’s excellent Sidebar gadget, DriveInfo. Next, a very simple example of Winamp 5 running the new larger Bento skin side by side with MiniLyrics, both with customised colour scheme to complement the basic (and stylishly swish I think) Aero Black theme. Incidently, I have MiniLyrics configured to download lyric files to the file location aswell as to embed them into the MP3 files directly. It may seem redundant, but I figure it opens up my music library’s functionality across platforms. Also noteworthy (at least to me) is that most often when I am listening to music, I am not actually sitting at my machine but rather cooking or trying to catch my toddler to spank/hug it. 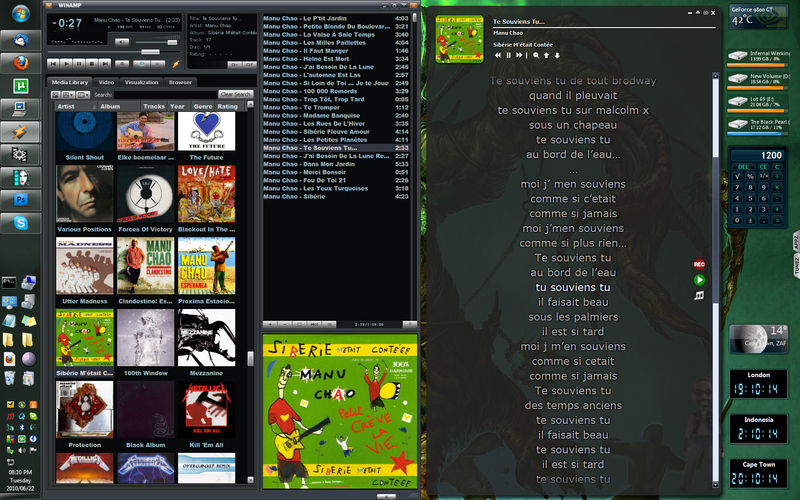 This layout gives me full access to my music whilst not obscuring any of my vital system information (ie HDD capacity, time, system tray, etc…) and not requiring me to use my hands to operate the mouse and keyboard moving windows out of the way. I once saw an insert about modern homes in Japan with informational video walls scattered throughout the apartment displaying various media and data. I yearn for the day, but in the meantime I will have to make do with LCD monitors and desktops I can get a wealth of information from just at a glance. Now, my new music file system is multi-tiered, with a reserve cache of tunes I am interested in which is kept separate from my collection proper and also facilitates a sorting/filtration media management scheme. 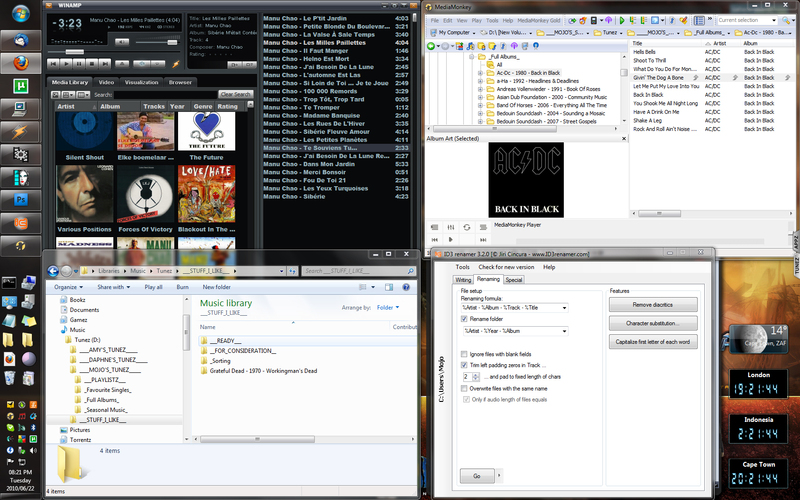 The primary rule for me now when it comes to incorporating music into my main collection (known as Mojo’s Tunez and displayed in the image above in the album view in Winamp) is the following. To be added, the music in question must adhere to the following criteria. 1. All metadata is to be correct and uniform (predetermined by my own naming convention). 2. All filenames are to be in accordance with, and generated from, the embedded metadata. 3. Folder must have a folder.jpg aswell as a playlist file for the album in question listing tracks in their correct order and named with an underscore prefix so as to make sure that it is always at the top of a folder when viewed with Explorer. 4. Each individual MP3 file must have album art (resized to 500×500 pixels exactly) and lyrics embedded. 5. Each album/disc will be contained in it’s own folder, named to an existing naming convention so as to sort (automatically by filename) by artist, the albums chronologically. 6. All MP3 files are to be normalised to uniform audio levels. I use MP3Gain which is totally awesome and absolutely free (not featured in the pic as I only use it occasionally when I have added a good few new albums to Mojo’s Tunez. 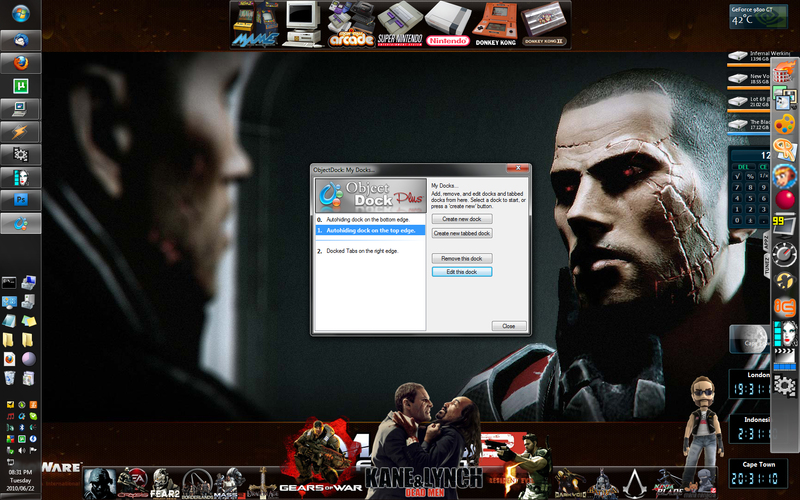 The one app that I always install directly after installation of OS and drivers is ObjectDock from Stardock. This brilliant application launcher not only looks bloody fantastic (if you put in a bit of work) but is also highly versatile and functional. I set all of my docks to hide offscreen when not in use, but for the purposes of this blog entry, I called them all up onto the screen. And lastly (phew, this has really taken it out of me), an image of my desktop at rest. The complete minimal amount of activity and clutter which can exist on my desktop. The only app running on the Super Bar is my email client. All other messaging services, drivers and apps run either off the system tray or in the background. PS: It’s not the default Firefox skin you tool, it’s Foxdie Graphite. I wanted something understated, classy and USEFUL which immediately disqualifies most of the more radically different themes. 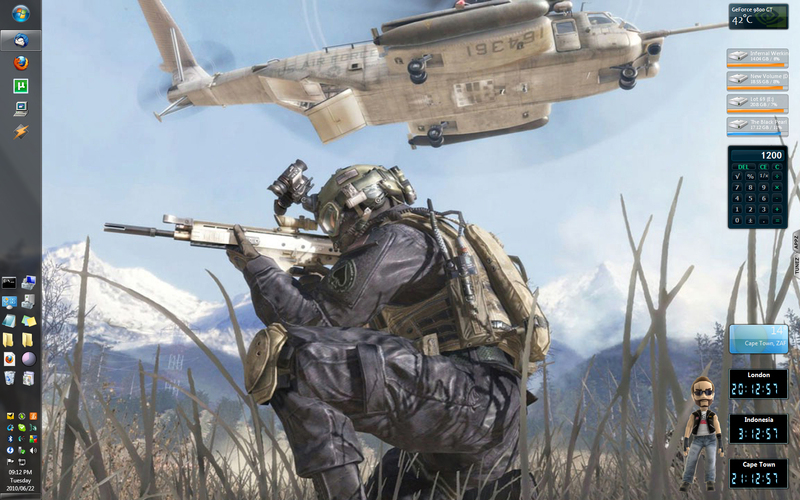 Also, those game icons are quite impressive, have you thought about making them available for download? And your Gspot icon, I still have/use the one you made with Faye Valetine from Cowboy Bebop cos the default icon is very low res.